My Greek lamb burger recipe combines traditional Greek seasonings and feta cheese. Serve with tzaziki (a refreshing creamy, garlic, yogurt and olive oil emulsion) & salad in a pitta bread, yum! Much of my essential guide to burger making is just as relevant to lamb as it is to beef so please read section too. Critical to all burgers is the ratio of lean meat to fat, you need it to be about 70% lean meat : 30% fat if you want a good moist burger so the blend of meat in your ground lamb is important. I grind 25% neck fillet with 75% shoulder and this gives me a good mix at an acceptable cost. If you buy ready ground lamb in the supermarket it will be approximately 20% fat, a bit too lean in my book but still easy and cost effective. Oregano is prevalent all over Greece and finds its way into many traditional Greek recipes and you'll find it in this Greek lamb burger recipe too. The other typically Greek ingredient is Feta cheese. Feta is a white crumbly cheese made from a mix of goat's and sheep's milk. It has a slightly salty taste not least because it is stored in brine and I think that it complements this burger mix beautifully. Note: Don't wait for the cheese to melt during the cooking because it won't, it will soften a little but in appearance it'll stay solid. The lamb burger recipe is really quick and easy so if you're planning on following the recipes for my selected accompaniments then you'll be better off starting with them. If you're buying in the pittas and tzaziki then just continue on. Throw all the ingredients into a mixing bowl and crumble in the Feta cheese. Get your hands in and give it a good mulch around to make sure that all the ingredients are thoroughly mixed. 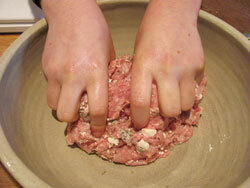 Wash you hands prior to making the patties and leave your hands wet, that way you'll stop the ground meat sticking to your fingers. For this and many more types on pattie making, follow my guide to the perfect burger. Now make your patties, you should get about 6 out of this mix. 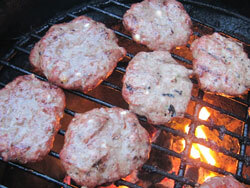 Place the patties on a medium hot grill and 7 to 8 minutes each side is the order of the day. Just let them sit, there's no need to flip them all the time otherwise the grill doesn't get chance to do its work. Despite the fact that this is lamb and it's safe to serve lamb pink, this is not the case with lamb (or indeed any meat) that has been ground. You must ensure that it is cooked through and the only way to know for sure is to use a BBQ thermometer and check the centre of your burger for 170°F (75°C). When your burgers are cooked, take them off the grill and let them rest for 5 minutes so that you get an even distribution of juices through the meat. This leaves you just enough time to pop the pitta breads onto the grill to warm through, give them a minute on each side taking care not to burn them. When warm, slide a knife into one side of the pitta to create a pocket and fill with a grilled lamb burger and a good dollop of tzaziki.